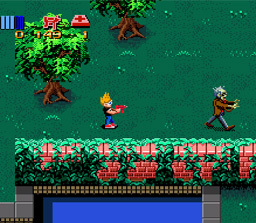 flashzombies.com - "Zombies Ate My Neighbors"
1993-1994 both great years for Super Nintendo and Sega Genesis owners, they got to play a classic zombie game called Zombies Ate My Neighbors. 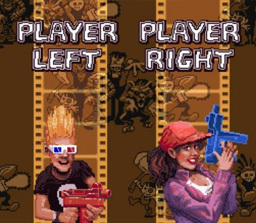 You get to choose between two characters, Zeke and Julie, or both in two-player mode. Tons of levels to kill off zombies, monsters, killers, giant ants you name it. Many different kinds of weapons, squirt gun, bazooka, 6 pack of pop. The object of the levels is to find the surviving neighbors. Each level has a maximum of ten neighbors. If they all die without the player saving at least one throughout the stage, the game is over. The neighbors are saved by touching them. Each neighbor is worth a certain amount of points. Very easy controls to get used to, you can go in every direction. They don't make it to hard to play, they make it fun. The graphics are outdated but worked for its time. Most people know this game and have played it. Zombies Ate My Neighbor's is in most people's top 10 zombie games, including mine. Pretty hard to find this game now a days, but probably find it at a used videogame shop. If your a huge zombie fan this is a must! What do you think of this game? 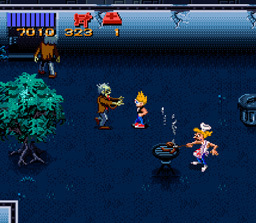 Click here to discuss Zombies Ate My Neighbors in our forum.